I’m serving up a couple of charts patterns in today’s intraday charts updates, namely a triangle on NZD/JPY and a channel on CAD/CHF. Check ’em out! 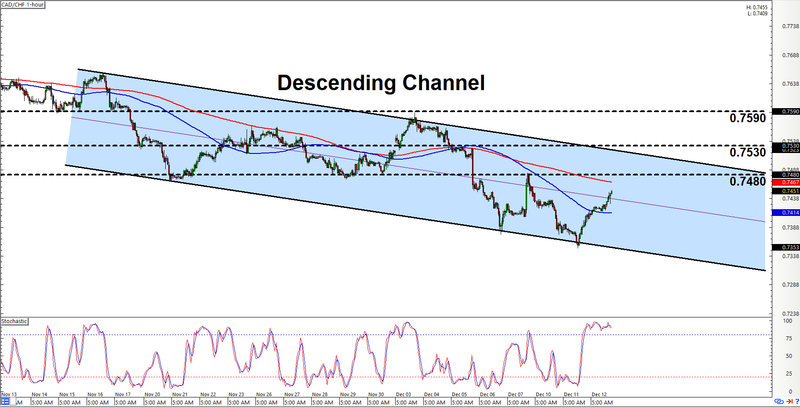 If you’ve got a thing for riding trends, or if you’re bearish on the Loonie, then check out that there descending channel on CAD/CHF’s 1-hour chart. As y’all can see, the pair is currently making its ways towards the channel’s resistance which should be somewhere just below 0.7530. Stochastic is already signaling overbought conditions and all that, however, so there’s a chance that resistance may form at 0.7480. Also, if (or when) the pair does arrive at 0.7480, then the 200 SMA could potentially act as dynamic resistance, which reinforces the idea that resistance may form somewhere around 0.7480. Conversely, if buying pressure is relentless and the pair blows past 0.7480 and 0.7530 to stage a topside channel breakout, then y’all may wanna think about bailing yo shorts. The pair would still need to clear 0.7590 in order to validate a topside channel breakout, though. 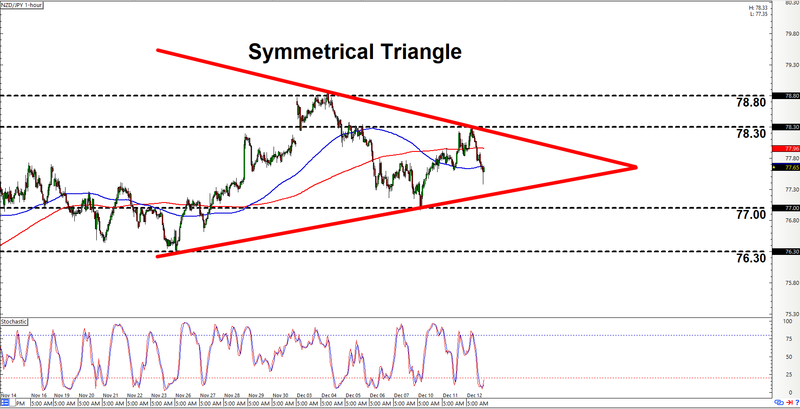 Price action on NZD/JPY has been consolidating while tapering to a point, forming that there symmetrical triangle in the process. A symmetrical triangle means that bulls and bears are fighting it out, but neither side has an advantage… for now. And that means that the pair is just as likely to break to the upside as the downside. Y’all may therefore wanna prepare for both scenarios. Just remember, however, that a topside breakout needs to clear 78.80 in order to validate a breakout. Otherwise, the risk remains high that the breakout may fail and end up being a fakeout. But if you’re gangsta enough, then you can try lookin’ for opportunities to go long when the pair clears 78.30. A downside breakout, meanwhile, needs to break lower past 76.30, ideally on strong bearish momentum, although a move lower past the 77.00 major psychological level would be an early sign that bears are winning out. Whichever scenario plays out, just remember to practice proper risk management as always, a’ight?